Soybean fields in parts of Arkansas, Missouri, and Tennessee are plagued by “superweeds” that have become resistant to glyphosate, the main ingredient in biotech company’s Monsanto’s RoundUp herbicide. Farmers are now dousing the plants with illegal chemicals to try and kill the rogue weeds. When agritech giant Monsanto rolled out its “RoundUp Ready” GMO seeds, the mammoth corporation made farmers a promise: the new crop system would allow them to use less chemicals on their crops. The worrisome weeds would surely die, Monsanto said, but the RoundUp Ready plants would withstand the chemicals and thrive, producing greater yields. Yup, farmers were told RoundUp was all they would ever need. But if you don’t strangle the weeds to death, they’ll strangle crops to death. Something has to be done. That “something” involves growers illegally spraying a powerful herbicide that is damaging hundreds of thousands of crops in the aforementioned states. 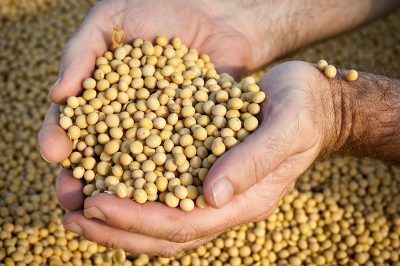 Regulators, farmers, and academics alike are pointing their fingers at Monsanto’s introduction this year of a new variety of genetically modified soybean. 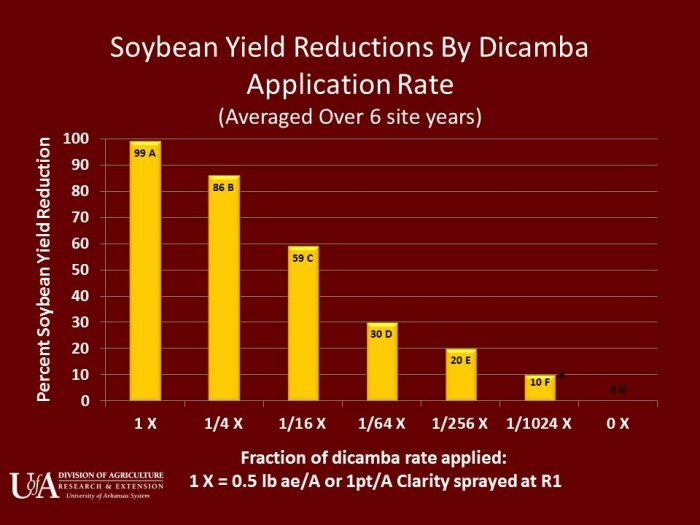 The thinking behind “Xtend,” the new version of the herbicide-tolerant soybeans, was that it would give farmers the option of also spraying dicamba. This, Monsanto believed, would kill off the weeds that RoundUp couldn’t touch. The problem with dicamba is that it’s known for evaporating quickly and drifting into neighboring fields. What’s more, ridiculously small amounts of the chemical can wreak havoc on soybeans. The new dicamba, you see, is still awaiting approval from the Environmental Protection Agency (EPA). When and if it gains approval, the agency may impose restrictions on how and when the chemical may be used. Monsanto didn’t care that it was unapproved, and it wasn’t going to sit around waiting on the silly government to give it the go-ahead. It went ahead and started selling its dicamba-resistant soybeans anyway, handing farmers a new weed-killing tool that wasn’t approved yet. According to Philip Miller, vice president of global regulatory affairs for Monsanto, the company “took quite a bit of effort” instructing farmers and pesticide dealers to avoid spraying older versions of dicamba over the new biotech fields and, for the most part, the farmers have complied. Those that haven’t are likely breaking the law out of desperation. “They see their soybeans out there all cupped up and stunted, their reaction is not good. In Missouri, more than 1,000 farmers have filed formal complaints with the state’s Department of Agriculture. In Arkansas, 25 complaints have been filed. If the department determines that a farmer has sprayed dicamba illegally, the farmer can be fined. In Arkansas, fines can reach $1,000. State regulators are considering raising the maximum fine to $5,000 because the lower fines aren’t stopping farmers from spraying dicamba. Even if the EPA approves the use of Monsanto’s reformulated version, the Arkansas Plant Board may implement new regulations that could drastically restrict the use of dicamba. There is also evidence that Monsanto’s new glyphosate-dicamba mixture might not work for very long. Recent research suggests that weeds may evolve to resist dicamba over just 3 years.